Myrtle Beach’s Grand Strand of golf courses stretches 60 miles from end to end. Ironically, some of the most challenging, scenic, memorable and affordable courses can be found far from the center of town near the border between South and North Carolina. Meadowlands Golf Club is one of those courses. Tucked just over the state line near Calabash, N.C., it’s a course that has stood the test of time. Golfers who book a tee time here are rewarded with pristine marsh and water views, warm welcomes and great service. Year-after-year, the course’s great conditioning gets rave reviews from golfers. 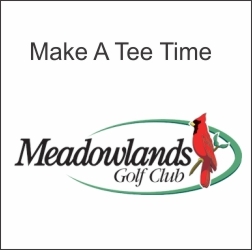 Meadowlands offers golfers a collection of interesting holes including solid par 3’s and a couple of par 5’s reachable in two, and five sets of tees to best fit your skill level. For the big hitters, it spans over 7,000 yards but ratchets down to a manageable 5,000 yards for forward tee players. Many of the holes are parkland-style with trees lining the fairways to catch errant shots, but Meadowlands also has its fair share of open meadow holes that provide plenty of room to work the ball. Built to Audubon International guidelines, the course is known as a haven for wildlife and for its preservation of native hardwood trees, natural wetlands and expansive meadows. Freshwater lakes dot the landscape, mostly adjacent to the fairways, and are sometimes hidden from the tee by carefully-placed mounding or trees. Architects Willard Byrd and David Johnson mostly saved the carries over water for the par 3’s, ensuring the course is manageable for those striking the ball well. Then there are the par 4’s that demand precision — and respect. One of the most memorable comes early in the round at Hole 3. Measuring 480 yards from the tips, it has water coming into play twice. Once the tee shot flies safely over the long expanse of water, the approach shot must be hit over water to a demanding two-tier green. It’s a stunningly beautiful hole and an exhilarating test of shotmaking. The overall atmosphere at Meadowlands is that of a respite from the hustle and bustle of city life. The whole facility has the feel of a well-manicured farm, a feeling reinforced by the rough-hewn farmhouse-style clubhouse with its large porches made for kicking back with a cold drink after a round. Golfers seeking a championship experience with reasonable fees will find it at Meadowlands. It delivers a high-value experience and will pleasantly surprise high-rollers used to playing more expensive courses in the area. Add in the hearty dose of Southern hospitality that’s in big supply there, and Meadowlands classifies as a hidden gem along the coast. NC Magazine ranked Meadowlands as one of the state’s top 10 new courses when it opened. Golf Digest readers continue to give it 3½ stars, recommending it as a good bet to build a golf vacation around — especially when teamed with its sister course, Farmstead Golf Links which is less than a mile away. At Meadowlands Golf Club and Farmstead Golf Links we encourage a standard of dress commensurate with the tradition and heritage of the game. No cut-offs, gym shorts, bathing suits, jeans (any color), tank tops, collarless shirts for men or very short skirts for women, please. We appreciate your cooperation. Appropriate golf shoes are required. Only non-metal spikes are acceptable. Meadowlands Golf Club and Farmstead Golf Links are licensed by the State of North Carolina to sell alcohol to customers for consumption on site. Personal coolers are prohibited on both golf courses. Small coolers are available with alcohol purchase.